« Just in Time for Friday the Thirteenth: Unlucky 13 Re-Released! I can see why this question comes up, though. When we work for large companies (or even small ones), we often have a list of tasks that we have to complete in a specified amount of time. Our days are super-focused because of that. When I worked as a pharmacist, hours would fly by and I wouldn’t even realize it because I was so busy! Writing on our own schedules is a huge change from that. But as long as we’re self-motivated and goal-oriented, the day will pass as quickly as it would in a pharmacy, an office, or wherever people work outside the home. Plus, writing is such a creative activity that it’s actually super easy to lose track of time. It goes along with something my mom always said when I was younger, “Our imaginations are our best playmates.” And it’s true — as long as we imagine new things, we’ll never be bored. Don’t surrender to boredom; fight it with my proven tips! Vary your extracurricular (i.e. non-writing) activities. Playing sports, working out, doing yoga, and practicing a musical instrument are all awesome activities to incorporate into your day. They get your blood pumping, keep you in superior physical and / or mental shape, and shake things up so you’re not just sitting in front of the computer all day. And bonus: All these activities can inspire you for your next writing project! Divide your day into chunks. Remember middle and high school, when your day was divided into seven regimented class periods? Recreate that feeling as a writer by cutting up your day into time allotments for each activity (i.e. marketing, blogging, writing new material, editing). Not only will you prevent boredom, you’ll also accomplish more. Win-win! Close your eyes and imagine. I had a teacher in elementary school who said, “If you’re bored, you’re boring.” I don’t entirely agree with this, but I do think an awesome boredom-buster is just taking a time-out and letting your imagination run wild (i.e. become “un-boring”). If you’re bored because you’re stuck on a stubborn scene of your novel, sit back, take cleansing breaths, and imagine. The answer will either come to you, or you’ll know it’s time to give the work a break and start something else. 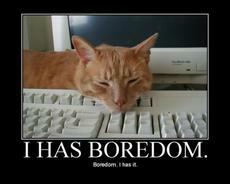 Freelancers out there, what are your best boredom-busters? I’d love to know if there’s something I missed!